Over the next few years it’s likely that you’ll soon start to hear more about a next generation broadband ISP technology called Fibre to the Distribution Point (FTTdp), which Ofcom are currently encouraging BT to trial. But what is FTTdp and will it really help UK homes and businesses to get ultrafast internet connections? Let’s take a look. BT are currently rolling out two primary fibre optic based broadband technologies, Fibre-to-the-Premises (FTTP/H) and Fibre-to-the-Cabinet (FTTC). In simple terms, FTTP takes the fibre optic cable right into your home for the most stable and best possible speeds (1000Mbps+ capable), while FTTC only takes the fibre to your local street cabinet and then uses VDSL2 over the “last mile” run of existing copper cable into your home for speeds of up to 80Mbps. Unfortunately deploying FTTP out to everybody would probably cost another £10bn to £20bn (estimates vary) and that’s simply not economically viable for BT. It is however possible to get FTTP-on-Demand (FoD) but this forces home owners and businesses into potentially paying thousands of pounds for the installation; it’s not an affordable option. The government, short of scrapping the HS2 project, aren’t likely to help either. But this leaves most of us stuck with FTTC technology (except for Virgin Media’s cable in urban areas), which is significantly slower and very distance dependent due to its reliance on copper for the “last mile” (i.e. speeds decline the further you are away from a street cabinet). Not that FTTC is bad and indeed the service is affordable, easy to setup and currently delivers superfast broadband (30Mbps+) speeds to most of those who use it. Similarly there are a number of innovations in the pipeline, such as Vectoring technology (summer 2013 trial details), that could soon help to improve its performance and push headline speeds above 100Mbps. In addition Vectoring (ITU-T G.993.5), which works to remove interference on FTTC/VDSL lines, is also necessary for G.Fast (ITU-T G.9700) to function properly (explained below). Never the less there’s always room for improvement and that’s one of the reasons why BT has recently started casting its eye towards G.Fast and FTTdp technology, which are effectively two halves of the same coin and work best together. G.Fast is essentially the next evolution of FTTC technology, which in theory could one day deliver symmetric speeds of up to 1Gbps (Alcatel-Lucent’s trial details). The problem with G.Fast is that its ultra-fast speeds only work over very short distances (i.e. up to around 200+ meters from your PCP / street cabinet), which means that many people aren’t likely to see much benefit. The solution is to shorten this copper distance by bringing the fibre optic cable out of street cabinets and moving it closer to homes via FTTdp. A quick look at the network diagram of a commercial FTTdp product from German network developer Lantiq helps to explain the difference (note: the speeds below may not be representative of the UK). As you can see the “distribution point” for the fibre optic cable is now much closer to homes, which means less copper wire to hinder the performance. It should be said that both G.Fast and FTTdp in particular are quite expensive. FTTdp also requires additional street works (digging up roads etc.) in order to run the fibre optic cables deeper into a community, which would dramatically shorten the last run of copper cable and deliver significantly improved speeds. However it is crucial to say that this sort of work doesn’t come cheap and indeed Alcatel-Lucent likens it to being a fair bit less than the cost of a full FTTP/H deployment, albeit with some very obvious differences as previously explained. “In terms of cost, G.fast vectoring is going to be relatively close to that of FTTH because, after all, you’re bringing fibre NEARLY to the home so you’re not going to save that much. And you require some additional equipment. But you avoid entering the home, and for some operators this is a very important factor and a very costly and time-consuming part of the roll-out. However it should be said that BT’s on-going rollout of FTTC, which is supported by some FTTP, has to a certain extent already done part of the ground work for FTTdp. Never the less BT would still need to spend quite a bit of money to roll-out G.Fast and FTTdp (i.e. expect them to focus on dense urban areas first as per usual). 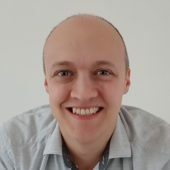 It’s important to remember that, although FTTdp and G.Fast are often spoken of in the same breath, they are still separate standards and thus have different performance aspirates depending upon the local network capabilities. FTTdp does not need G.Fast but G.Fast would clearly work best in that sort of environment. Can Ofcom actually do this sort of thing? Force BT to trial it and offer it as a product? I thought they just regulated what was out there? What if (quite rightly) BT said they weren’t interested because as usual they’d be stumping up the development and rollout costs with other ISP’s expecting to use it at a very low price. If a number of ISP’s have expressed interest they can trial it themselves can’t they? PIA would cover this I would have thought or if not would only require a small adjustment. Ofcom has not submitted a formal request for the trial so it’s just a soft recommendation and in fairness BT will probably get around to it eventually anyway. At least that’s the impression we got. Hmm good question. Technically Ofcom could force something if they felt it necessary for BT’s “Undertakings” (I doubt that would stretch to FTTdp though) but generally speaking a SoR request would normally come from a rival ISP and if rejected by BT then Ofcom might have to consider it on competitive grounds (not really relevant here). But most of the time BT seems to develop these things itself so there’s no issue. Another reason is we may see the performance of FTTC degrade as the take up increases. This uses legacy copper. 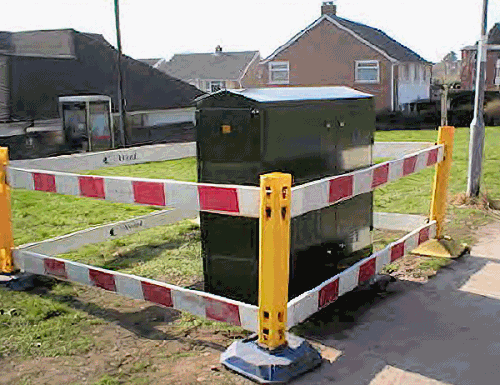 Why will FTTC degrade? I’m not sure what you mean? Obviously it is still in its early stages but G.Fast is supposed to be able to deliver 1Gbps over copper at < 100m and I would suggest that most if not all properties are within 100m of their telephone pole? So even if these customers were on FTTC and getting 40, 50Mbps now and 100Mbps+ with vectoring/bonding etc later I would still say a jump from that to 1Gbps would be a big advantage? Quote “This uses legacy copper. Why will FTTC degrade? Not sold on this at all. Rivals cant be bothered to invest in cabinets. My exchange has 79 cabinets but around 5000 dps. No way are you going to cover these. Maybe a nice mdu solution or odd rural but thats it. Once the fibre is knocking on the curb you may as well go the whole hog, if you installed poles for buried ug sites you dont have to dig up peoples gardens. personallyline extenders / regenerators, advances in cabinet capability and maybe one day removing power mask restrictions on 2mhz are where its at, possibly even aggregators, but at these distances….. no. Try again at 500m at we may have something. You also do not need to bother with the short lines so you are just looking at the medium to long lines. this is surely something that is a very likely candidate for large areas of exchange only lines, clustered around exchanges in urban areas. since the areas are built up and frequently have difficult arrangements with multiple use / dwelling buildings, this would probably make much more sense to BT than FTTp/h. BT has had G.FAST for over a year now in the labs! No deployment plans as yet. There are a number of viable use cases. For all those poor people out there with long lines,including myself and who live over 1KM from their PCP with no FTTC I believe BT should go with DSL Rings.The DP would have small DSLAM fitted to the pole with a choice of bonding to increase the bandwidth or supplied by FTTDP where possible. the quote from Mathew Pitt-Bailey, Alcatel-Lucent’s Director of Comms “But you avoid entering the home,” is not completely correct. Power has to come from somewhere to the dP equipment, and this somewhere is from inside the home. See this PR http://www.lantiq.com/media-center/news/press/235/ and more precisely the bit about “reverse power feeding circuitry”. I would like to know how the technology transfers from fiber to copper at the Dp. Is it active electronics, if so how is it powered? I believe this G.Fast is being considered for the Australian NBN as well. I don’t think it will come to much with the exception maybe of greenfield deployments because, well, if you need an active cabinet every 250m (probably going to be much further apart than that)rather than 1 per estate under FTTH, then the costs are going to be even larger for this than for a GPON brownfield deployment. Surely. It has a place, but it does not remove the need for full FTTH. FTTdp nodes powering is managed thanks to a power supply placed in the homes of the customers that send current over the same copper pair used for data connectivity, which means no need for local powering. 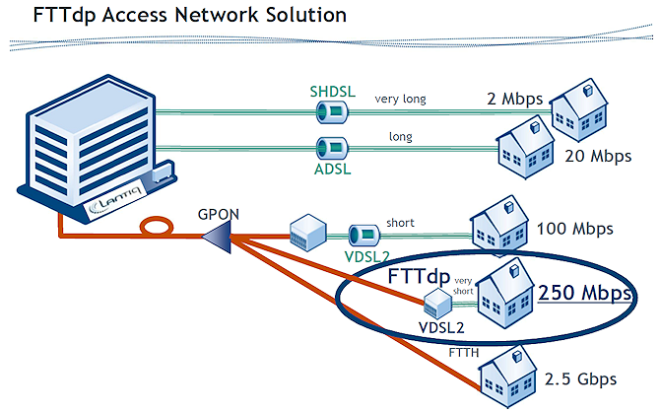 FTTdp can be considered as a “complement” to FTTH, offering comparable speeds over copper in areas where full fibre deployment is impossible (for technical or costs reasons, like old buildings or rural areas): VDSL2-FTTdp is capable of reaching more than 200Mbps in downstream and more than 50Mbps upstream, so completely compaltible with many actual 200/20 FTTH commercial offers.